This type is created using attribute((vector_size(n)), where "n" specifies the vector size in bytes; or from an Altivec __vector or vector declaration. Since the constructor takes the number of vector elements, the client is responsible for converting the size into the number of elements. Definition at line 3180 of file Type.h. Definition at line 3182 of file Type.h. Definition at line 243 of file Type.cpp. Definition at line 247 of file Type.cpp. Definition at line 3243 of file Type.h. Definition at line 3223 of file Type.h. Definition at line 3215 of file Type.h. 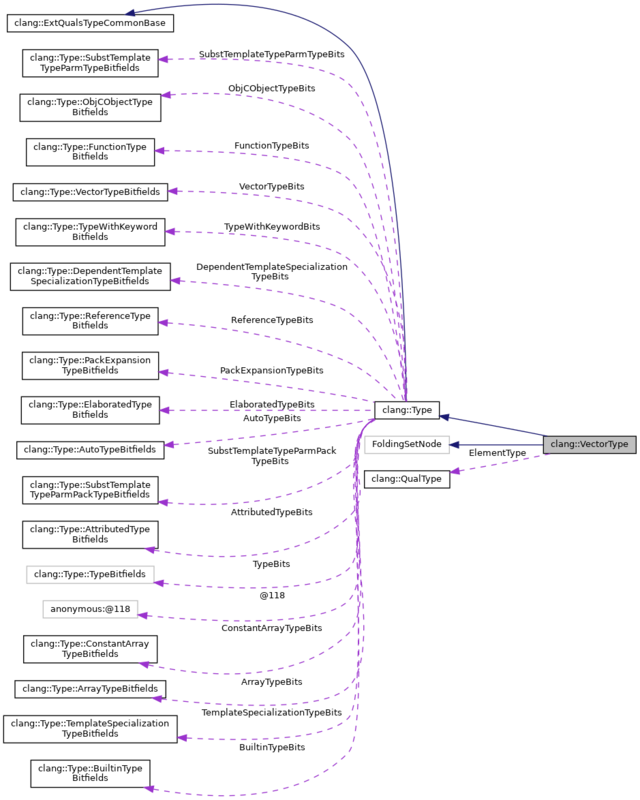 Referenced by clang::ASTContext::areCompatibleVectorTypes(), areCompatVectorTypes(), checkOpenCLConditionVector(), checkVectorDecomposition(), checkVectorResult(), checkVectorShift(), clang::CodeGen::CodeGenTypes::ConvertType(), clang::CodeGen::CodeGenFunction::EmitExtVectorElementLValue(), EvaluateVector(), clang::analyze_printf::PrintfSpecifier::fixType(), clang::Type::getArrayElementTypeNoTypeQual(), clang::Type::hasAttr(), hasDefaultSetterName(), isTypeSubstitutable(), mangleAArch64VectorBase(), OpenCLConvertScalarsToVectors(), tryGCCVectorConvertAndSplat(), clang::ASTTypeWriter::VisitArrayType(), clang::ASTNodeImporter::VisitExtVectorType(), clang::ASTNodeTraverser< Derived, NodeDelegateType >::VisitVectorType(), and clang::ASTNodeImporter::VisitVectorType(). Definition at line 3216 of file Type.h. Referenced by clang::ASTContext::areCompatibleVectorTypes(), areCompatVectorTypes(), checkVectorDecomposition(), checkVectorResult(), checkVectorShift(), clang::CodeGen::CodeGenTypes::ConvertType(), clang::CodeGen::CodeGenFunction::EmitLoadOfExtVectorElementLValue(), EvaluateVector(), clang::analyze_printf::PrintfSpecifier::fixType(), hasDefaultSetterName(), isTypeSubstitutable(), mangleAArch64VectorBase(), OpenCLConvertScalarsToVectors(), clang::ASTTypeWriter::VisitArrayType(), clang::ASTNodeImporter::VisitExtVectorType(), clang::TextNodeDumper::VisitVectorType(), and clang::ASTNodeImporter::VisitVectorType(). Definition at line 3225 of file Type.h. Referenced by clang::ASTContext::areCompatibleVectorTypes(), clang::Sema::BuildVectorLiteral(), clang::Sema::CheckVectorCompareOperands(), clang::Sema::CheckVectorOperands(), isTypeSubstitutable(), mangleAArch64VectorBase(), clang::ASTTypeWriter::VisitArrayType(), clang::TextNodeDumper::VisitVectorType(), and clang::ASTNodeImporter::VisitVectorType(). Definition at line 3222 of file Type.h. Definition at line 3218 of file Type.h. Definition at line 3229 of file Type.h. 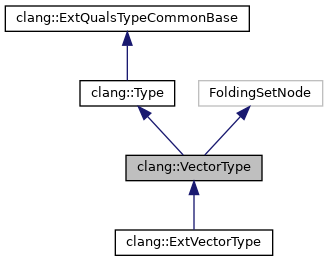 Referenced by clang::ASTContext::getExtVectorType(), and clang::ASTContext::getVectorType(). Definition at line 3234 of file Type.h. Definition at line 3203 of file Type.h. Definition at line 3206 of file Type.h.